Gadget: They say it couldn't be done but I've done it! My Sleep Walker Summoner Mark 8 is a succes! Bwa ha ha ha! 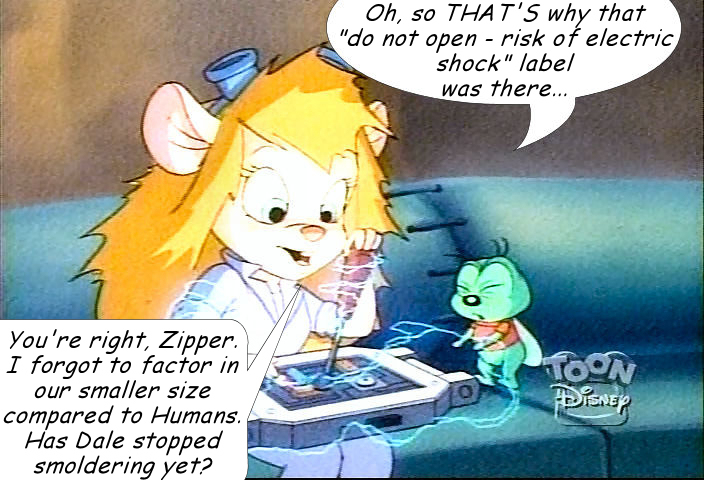 Gadget: Golly, Zipper, I know it's the dark side, but my invention works twice as well this way! Gadget: Aww come on, Zipper! There's no way the guys could possibly guess that I had a date with Sparky today. Gadget: Golly, Zipper, those new powers sure are something. Just don't tell Dale. I can only imagaine the names he'd come up with for you. Gadget: Golly Zipper, I know that Dale said my cooking tastes like machine oil, but you could have at least tried my TV dinner. Gadget: There! The transmogrification process has started, Zipper! Soon you'll be a mouse like me, and then we can finally be married! I can't wait to tell Chip and Dale! Gadget: OUCH! *CENSORED* Okay, who put batteries in here while I was talking to my agent? Chip (trying to look innocent): It was Dale. I think he said something about getting back at you for shooting him in the face with a plunger last week. Gadget: Zap me all you want Darth Zip, I'm still not turning to the Dark Side. Monty (OS): Zippah, no! Don't look at the light! Gadget: Did you say something, Zipper? "Gadget": I can't look... Zipper, did my Mind Transferral Device work? Gadget:This is the next Nintendo - Nintendo Hairriser! GADGET: Of course it's supposed to do that. Have I ever endangered you, Zipper? GADGET: Oh come on...your eyelids grew back. Gadget: Okay HAL, I'm going to repair you and set you up in our computer as long as you promise to only do good things from now on. HAL 9000: Of course, my love. Whatever you say. Gadget: Oh, and stop trying to date me. HAL 9000: I'm sorry Gadget, but I'm afraid I can't do that. Gadget: Anything in string theory that theoretically can go wrong will go wrong.....phew!!! Can this be one of those times?